Vino da Tavola (VDT) -A basic, table wine, made for local consumption. Indicazione Geografica Tipica (IGT) Wine from a specific region within Italy. This appellation was created in 1992 for wines that were considered to be of higher quality than simple table wines, but which did not conform to the strict wine laws for their region. Before the IGT was created, "Super Tuscan" wines such as Tignanello were labeled Vino da Tavola. QWPSR: Denominazione di Origine Controllata (DOC) & Denominazione di Origine Controllata e Garantita (DOCG) - DOC and DOCG wines are more specific than an IGT, and the permitted grapes are also more carefully controlled and defined. The DOC system began in 1963. The main difference between a DOC and a DOCG is that a DOCG must pass a blind quality taste test in addition to conforming to the strict legal requirements to be designated as a wine from the area in question. After the introduction of new wine laws in 1992 by the Italian government, clear rules were made regarding requirements for DOCG entry. For example, alcohol levels and grapes per hectare. Arneis - A crisp and floral variety from Piedmont, which has been grown there since the 15th century. Catarratto - Common in Sicily - this is the most widely planted white variety in Salaparuta. Fiano - Grown on the southwest coast of Italy, the wines from this grape can be described as dewy and herbal, often with notes of pinenut and pesto. Garganega - The main grape variety for wines labeled Soave, this is a crisp, dry white wine from the Veneto wine region of Italy. It's a very popular wine that hails from northeast Italy around the city of Verona. Currently, there are over 3,500 distinct producers of Soave. Malvasia Bianca - Another white variety that peeks up in all corners of Italy with a wide variety of clones and mutations. Can range from easy quaffers to funky, musty whites. Moscato - Grown mainly in Piedmont, it is mainly used in the slightly-sparkling (frizzante), semi-sweet Moscato d'Asti. Not to be confused with moscato giallo and moscato rosa, two Germanic varietals that are grown in Trentino Alto-Adige. Nuragus - An ancient Phoenician variety found in southern Sardegna. Light and tart wines that are drunk as an apertif in their homeland. Pigato - A heavily acidic variety from Liguria, the wines are vinified to pair with a cuisine rich in seafood. Pinot Grigio - A hugely successful commercial grape (known as Pinot Gris in France), its wines are characterised by crispness and cleanness. As a hugely mass-produced wine, it is usually delicate and mild, but in a good producers' hands, the wine can grow more full-bodied and complex. The main problem with the grape is that to satisfy the commercial demand, the grapes are harvested too early every year, leading to wines without character. Ribolla Gialla - A Slovenian grape that now makes its home in Friuli, these wines are decidedly old-world, with aromas of pineapple and mustiness. Tocai Friulano - A variety distantly related to Sauvignon Blanc, it yields the top wine of Friuli, full of peachiness and minerality. Currently, there is a bit of controversy regarding the name, as the EC has demanded it changed to avoid confusion with the Tokay dessert wine from Hungary. Trebbiano - This is the most widely planted white varietal in Italy. It is grown throughout the country, with a special focus on the wines from Abruzzo and from Lazio, including Frascati. Mostly, they are pale, easy drinking wines, but trebbiano from producers such as Valentini have been known to age for 15+ years. It is known as Ugni Blanc in France. Verdicchio - This is grown in the areas of Castelli di Jesi and Matelica in the Marche region and gives its name to the varietal white wine made from it. The name comes from "verde" (green). The white wines are noted for their high acidity and a characteristic nutty flavour with a hint of honey. Vermentino - This is widely planted in northern Sardinia and also found in Tuscan and Ligurian coastal districts. Wines are particularly popular to accompany fish and seafood. Passerina - mainly derives from Passerina grapes (it may even be produced purely with these), plus a minimum percentage of other white grapes and may be still, sparkling or passito. In its still version, one appreciates the acidic profile, which is typical of these grapes, as well as the delicate aromas. Pecorino doc - is the most outstanding one among the Piceno DOC wines: the rediscovery of this vine enabled the particular unique features of the wine that was only produced purely in the past to be revealed locally and then to the general public. Falerio - DOC Falerio dei Colli Ascolani was instituted in 1975 and later modified in 1994. The regulation was subsequently replaced in 1997 and later regulated again in 2003. Its name is bound to the historic origins of the Piceno region and derives from Faleria, an ancient Roman city, called Falerone today. Other important white grapes include Carricante, Coda de Volpe, Cortese, Falanghina, Grechetto, Grillo, Inzolia, Picolit, Traminer, Verduzzo, and Vernaccia. Non-native varieties that the Italians plant include Chardonnay, Gewürztraminer (sometimes called traminer aromatico), Petite Arvine, Riesling, and many others. Aglianico - Considered the "noble varietal of the south," it is primarily grown in Basilicata and Campania. The name is derived from Hellenic so probably comes from Greece and is thick skinned and spicy producing rustic and powerful wines in many cases. Barbera - The most widely grown red wine grape of Piedmont and Southern Lombardy, notably around the towns of Asti and Alba, and Pavia. The wines of Barbera were once simply "what you drank while waiting for the Barolo to be ready." The wine making standards are now much higher than in the past and aged Barbera gets the name "Barbera Superiore" and sometimes aged in French barriques becoming "Barbera Barricato". The wine has a dark colour, cherry fruit aromas and nose balanced by food friendly acidity. Corvina - Along with the varietals rondinella and molinara, this is the principal grape which makes the famous wines of the Veneto region: Valpolicella and Amarone. Valpolicella wine has dark cherry fruit and spice. After the grapes undergo passito (a drying process), the wine is then called Amarone, and is high in alcohol (16% and up) and full of raisin, prune, and syrupy fruits. Amarone is an unusual style of wine since it is traditionally dried on mats in lofts for 4 months after harvest, using a process called appassimento. The gapes lose up to a third of their water and the sugar level rises giving the wine significantly more concentration. The largest producer is Masi and in December 2009, there was celebration when the acclaimed Amarone di Valpolicella was finally awarded its long-sought after DOCG status. Dolcetto - A grape that grows alongside Barbera and Nebbiolo in Piedmont, its name means "little sweet one"", referring not to the taste of the wine, but the ease in which it grows and makes great wines, suitable for everyday drinking. Flavours of wild blackberries and herbs exude are characteristic for the wine. Malvasia Nera - Red Malvasia varietal from Piedmont. A sweet and perfumed wine, sometimes elaborated in the passito style. Montepulciano - The grape of this name is not to be confused with the Tuscan town of Montepulciano; it is most widely planted on the opposite coast in Abruzzo. Its wines develop silky plum-like fruit, friendly acidity, and light tannin. More recently, producers have been creating a richer and deeper coloured version of the wine. Nebbiolo - The most noble of Italy's varieties. The name (meaning "little fog") refers to the autumn fog that blankets most of Piedmont where Nebbiolo is mainly grown, and where it achieves the most successful results. A difficult grape variety to cultivate, it produces the most renowned Barolo and Barbaresco, made in province of Cuneo, along with the lesser-known Sforzato, Inferno and Sassella made in Valtellina, Ghemme and Gattinara, made in Vercelli's province. The wines are known for their elegance and power with a bouquet of wild mushroom, truffle, roses, and tar. Traditionally produced Barolo can be aged for fifty years-plus, and is regarded by many wine enthusiasts as the greatest wine of Italy. Negroamaro - The name literally means "black and bitter". A widely planted grape with its concentration in the region of Puglia, it is the backbone of the Salice Salentino: spicy, toasty, and full of dark red fruits. Nero d'Avola - Almost unheard of outside of Sicily until recently, this native varietal of Sicily has gained attention for its plummy fruit and balanced acidity & tannins. The quality of Nero d'Avola has improved markedly over the last few years. Primitivo - A red grape planted found in southern Italy, most notably in Puglia. Primitivo is robust and rustic, with spicy black fruit notes, and thrives in very warm climates, where it can achieve very high alcohol levels. Sagrantino - A native to Umbria, it is only planted on 250 hectares, but the wines produced from it (either blended with Sangiovese as Rosso di Montefalco or as a pure Sagrantino) are world-renowned. Inky purple, with rustic fruit and heavy tannins, these wines are at their best after some cellaring. Sangiovese - Italy's claim to fame, the pride of Tuscany. Traditionally made, the wines are full of cherry fruit, earth, and cedar. It produces Chianti (Classico), Rosso di Montalcino, Brunello di Montalcino, Rosso di Montepulciano, Montefalco Rosso, and many others. Sangiovese is also the main grape in many of the acclaimed, modern-styled "Super-Tuscans", where it is blended with Bordeaux varietals (Cabernet Sauvignon, Merlot, and Cabernet Franc) and typically aged in French oak barrels, resulting a wine primed for the international market in the style of a typical California cabernet: oaky, high-alcohol, and a ripe, jammy, fruit-forward profile. Rosso Piceno - The prestigious Rosso Piceno DOC, instituted by the Regulation in 1968 and later modified in 1997 and in 2005, was the first DOC wine to be produced on this land. The history of this wine is age-old and its name dates back to the pre-Roman Piceno population. Rosso Piceno Superiore - he Rosso Piceno Superiore labelled wine is produced in a limited area (just 13 municipalities are authorised) in the province of Ascoli Piceno and differs from Rosso Piceno in view of its additional refinement in wood, which gives the wine even richer and more variegated sensations and aromas, often turning it into a meditation gem. Other major red varieties are Ciliegolo, Gaglioppo, Lagrein, Lambrusco, Monica, Nerello Mascalese, Pignolo, Primitivo (Zinfandel in California), Refosco, Schiava, Schiopettino, Teroldego, and Uva di Troia. "International" varieties such as Cabernet Franc, Cabernet Sauvignon, Merlot, and Syrah are also widely grown. Piemonte wine is the range of Italian wines made in the province of Piedmont in the northwestern corner of Italy. Whilst Turin is the capital of Piedmont, the majority of the region's winemaking (about 90%) takes place in the southern part of Piedmont around the towns of Alba (in Cuneo), Asti and Alessandria. The best-known wines from the region include Barolo and Barbaresco which are made from the Nebbiolo grape. These wines are ideal for cellaring and a well-aged Barolo for instance may leave a feeling of drinking velvet because the tannins are polished and integrated more and more into the wine. As the wine matures the colour becomes more brownish and rust-red. Barbera is the most widely-planted grape in the region, but Nebbiolo and Dolcetto account for a significant portion of the area's red wine production as well. With white wines, Moscato is the most prominent with its sparkling and frizzante style wines including Asti . Other notable white wines include styles made from the Cortese grape in Gavi as well as blends of Cortese with Arneis and Favorita from Colli Tortonesi and Alto Monferrato. The Brachetto is another variety used for making sweet and sparkling red wines. Wine made using the Barbera grape is often fruity and delicate with less tannin than wine made from the Nebbiolo grape. Dolcetto on the other side, is not as the name indicates sweet (dolce is Italian for sweet). The grape gives fresh and dry red wines with some tannin. The wines made on the Dolcetto grape should be consumed young. Langhe - includes the hill country around the city of Alba and the Roero. Piedmont produces more DOC/G wines by volume than any other Italian wine region with nearly 84% of all the areas wine production falling under a DOC/G designation. The area has no Indicazione Geografica Tipica (IGT) classification, in contrast to Tuscany where IGT wines or Super Tuscans make up a significant portion of that region's wine production. The Piedmont region has 45 Denominazione di origine controllata (DOC) and 12 Denominazione di Origine Controllata e Garantita (DOCG). Some varietal style wines are made in the Piedmont region with the name of the grape and town both appearing on the label. Some DOC examples include Barbera d'Alba, Barbera d'Asti, and Dolcetto di Dogliani made entirely from the Barbera and Dolcetto grape respectively. Wines from the Central Valley of La Morra and Barolo tend to be very perfumed and velvety with less tannins than other Barolo's. The soil of the Central Valley itself is more clay based with increased levels of magnesium oxide and manganese. The wines from the Serralunga Valley are more full bodied and tannic and require aging of 12–15 years before they peak. The soil of the Serralunga is heavy in sand, iron, limestone, phosphorus and potassium. Barolo DOCG rules require ageing for a minimum of 3 years, two of which must be in wooden barrels. Reserva wines must be aged for 5 years. An unusually long growing season means the Nebbiolo grape is not easy to grow. Being produced from the same grape as Barolo and less than 10 miles apart, there are a lot of similarities that Barbaresco has with it neighboring wines but the slight maritime influence of the Tanaro river helps produce distinctive wines. On the whole less tannic than Barolo, Barbaresco tend to be more elegant and approachable in their youth. The Barbaresco DOCG regulation stipulates wines with minimum alcohol content of 12.5% and 2 years minimum aging in the winery for standard labels and 4 years minimum for riservas wines. Being an even smaller zone then Barolo, producers in the region produce a little more than 200,000 cases annually. The majority of Barbaresco production takes place in 3 communities. The soils in the Barbaresco zone are more uniform across the region which tends to produce a more consistent profile with the wines then what could be achieved across the widely different areas of Barolo. The white wines made from the Moscato Bianco (also known as Muscat Blanc à Petits Grains) are most noted for their frizzante and sparkling spumante styles but some still wines are produced as well. Located northeast of Alba, the wines from the Asti region are known for their delicate light bodies, low alcohol content and slightly sweet nature. Like many sparkling wines, Asti are not vintage dated even though a majority of the grapes might all come from the same vintage year. The wines are typically at their peak between 1 and 2 years from their release. The Barbera grape is the most widely planted variety in all of the Piedmont and makes a juicy, muscular red wine that is not as tannic as Barolo and Barbaresco. It is grown in nearly every major wine making region of the Piedmont but seems to do best near the towns of Alba and Asti. Some producers are experimenting with blending Barbera with Nebbiolo to combine the former's fruitiness with the latter's structure. The light fruitiness of wines from the Dolcetto grape has caused some wine writers to describe it as the Italian version of Beaujolais. The wines are somewhat spicy with little acid and tannins. They are able to be drunk relatively young and tend to be the every day drinking wines of the locals. Up until the 1980s, when the wines of the Friuli-Venezia Giulia began to receive notice, the white wines of the Gavi region were reported as the best expression of dry Italian wine. Made primarily from the Cortese grape, these wines are noted for their dry, crisp acidity with citrus and mineral notes. The white wines made from the Arneis grape tend to be dry, vibrant and full body with notes of pears and apricots. Produced in the hills of the Roero to the northwest of Alba, the name Arneis means "rascal" in Piedmontese. Brunello is the name of the local Sangiovese variety that is grown around the village of Montalcino. Located south of the Chianti Classico zone, the Montalcino range is drier and warmer than Chianti. Monte Amiata shields the area from the winds coming from the southeast. Many of the area's vineyards are located on the hillsides leading up towards the mountain to elevations of around 1,640 ft (500 m) though some vineyards can be found in lower-lying areas. The wines of northern and eastern regions tend to ripen more slowly and produce more perfumed and lighter wines. The southern and western regions are warmer, and the resulting wines tend to be richer and more intense. Brunello di Montalcino wines are required to be aged for at least four years prior to being released, with Riserva wines needing five years. Brunellos tend to be very tight and tannic in their youth, needing at least a decade or two before they start to soften with wines from excellent vintages having the potential to do well past 50 years. In 1984, the Montalcino region was granted the DOC designation of Rosso di Montalcino. Often called "Baby Brunellos", these wines are typically made from the same grapes, vineyards and style as the regular Brunello di Montalcino but are not aged as long. While similar to Brunellos in flavour and aromas, these wines are often lighter in body and more approachable in their youth. Carmignano was the first Tuscan DOCG to sanction the use of blending Cabernet Sauvignon (pictured) with Sangiovese. Noted for the quality of its wines since the Middle Ages, Carmignano was identified by Cosimo III de' Medici, Grand Duke of Tuscany as one of the superior wine producing areas of Tuscany and granted special legal status in 1716. In the 18th century, the producers of the Carmignano region developed a tradition of blending Sangiovese with Cabernet Sauvignon, long before the practice became popularized by the "Super Tuscan" of the late 20th century. In 1975, the region was awarded Denominazione di origine controllata (DOC) status and subsequently promoted to Denominazione di Origine Controllata e Garantita (DOCG) status in 1990 (retroactive to the 1988 vintage). Today Carmignano has approximately 270 acres (110 ha) planted. Also see Fermented Grape Review of the Chianti Region. Click here. Located in the central region of Tuscany, the Chianti zone is Tuscanys' largest classified wine region and produces over eight million cases a year. In addition to producing the well known red Chianti wine, the Chianti zone also produces white, other Rosso reds and Vin Santo. The region is split into two DOCG- Chianti and Chianti Classico. The Chianti Classico zone covers the area between Florence and Siena, which is the original Chianti region, and where some of the best expressions of Chianti wine are produced. The larger Chianti DOCG zone is further divided in six DOC sub-zones and areas in the western part of the province of Pisa, the Florentine hills north of Chianti Classico in the province of Florence, the Siena hills south of the city in the province of Siena, the province of Arezzo and the area around the communes of Rufina and Pistoia. Since 1996, Chianti is permitted to include as little as 75% Sangiovese, a maximum of 10% Canaiolo, up to 10% of the white wine grapes Malvasia and Trebbiano and up to 15% of any other red wine grape grown in the region, such as Cabernet Sauvignon. This variety of grapes and usage is one reason why Chianti can vary widely from producer to producer. The use of white grapes in the blend can alter the style of Chianti by softening the wines with a higher percentage of white grapes, typically indicating that the wine is meant to be drunk younger and not aged for long. In general, Chianti Classicos are described as medium-bodied wines with firm, dry tannins. The characteristic aroma is cherry but it can also carry nutty and floral notes as well. 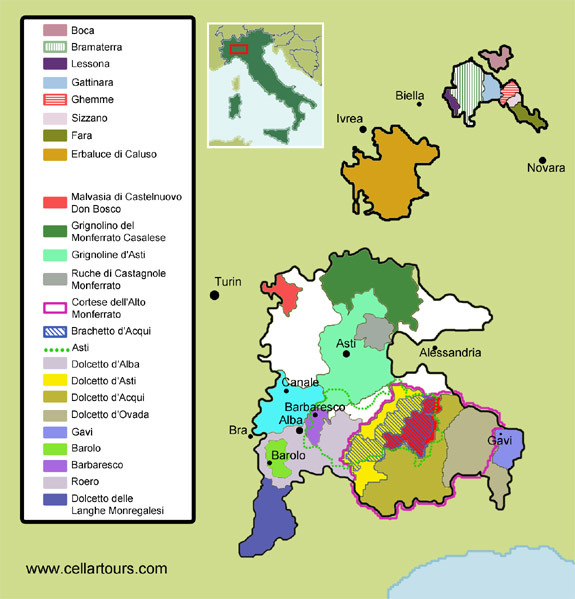 The Chianti Classico region covers approximately 100 square miles (260 km2) and includes the communes of Castellina, Gaiole, Greve and Radda as well as parts of five other neighboring communes. The terroir of the Classico zone varies throughout the region depending on the vineyards' altitude, soil type and distance from the Arno River. The soils of the northern communes, such as Greve, are richer in clay deposits while those in the southern communes, like Gaiole, are harder and stonier. Riserva Chianti is aged for at least 27 months, some of it in oak, and must have a minimum alcohol content of 12.5%. Wines from the Chianti DOCG can carry the name of one of the six sub-zones or just the Chianti designation. The Chianti Superiore designation refers to wines produced in the provinces of Florence and Siena but not in the Classico zone. Vernaccia di San Gimignano is a white wine made from the Vernaccia grape in the areas around San Gimignano. In 1966, it was the first wine to receive a DOC designation. This wine style has been made in the area for over seven centuries and is considered Tuscany's best white wine. It is dry, full bodied with earthy notes of honey and minerals. In some styles it can made to emphasize the fruit more and some producers have experimented with aging or fermenting the wine in oak barrels in order to give the wine a sense of creaminess or toastiness. The Vino Nobile di Montepulciano received its DOCG status shortly after Brunello di Montalcino, in 1980. The DOCG covers the red wine of the Montepulciano area. The wine received its name in the 17th century, when it was the favourite wine of the Tuscan nobility. Located in the southeastern region of Tuscany, the climate of the region is strongly influenced by the sea. The variety of Sangiovese in Montepulciano is known as Prugnolo Gentile and is required to account for at least 80% of the wine. Traditionally Canaiolo and Mammolo make up the remaining part of the blend but some producers have begun to experiment with Cabernet Sauvignon and Merlot. The wines are required to age two years prior to release, with an additional year if it is to be a riserva. The recent use of French oak barrels has increased the body and intensity of the wines which are noted for their plummy fruit, almond notes and smooth tannins.